A cute gift but not worth the money. This month’s non-food item was a cheap, cellophane hard boiled egg cover for Easter. It had some great cookies and some wrapped small candies. I’ve always wanted to visit Russia since I was in first grade!! I’m 25 now and I’m learning Russian and Romanian. The person who makes this box makes me so happy I love it so much thank u for making me happy!!! Your box turkey saved my life. My husband is Russian descent and I got this a a gift from his grand daughters. He love it. Theres interesting information included with yummy snacks. It was a big hit at my house. Every month, we strive to bring a fun selection of delicious treats to our customers and it means the world to us that you enjoyed them! While we have not offered free shipping to date, we firmly believe that the value of the imported snacks we provide in our Russian Snack Packs and The Russia Boxes is well worth it. Thank you for letting us know that you loved The Russian Snack Pack! This box is great if you want to try out eastern European and russian snacks. The candies were delicious and there were so many different snacks included. I did wish that the cultural item was something else (it was soap), but other than that, I loved this box! I really enjoyed the cool lifestyle items in this box. Some of them include Russian magnets and an air freshener. The snacks that were sent were also delicious. I also like how the items are from Eastern Europe. It's really awesome to try different snacks from different countries. I absolutely LOVE this box! This box brought me and my family so much joy. My grandparents came to this country from Russia, and this box reminded me of them, visits to their house, and stories they told. This box is definitely a keeper. Thank you so much for this awesome box!!! Really enjoyed this! Thank you for such a prompt wonderful shipment! 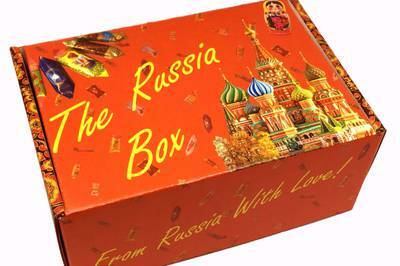 The Russia Box is a good and tasty experience of Russia culture. There were a variety of unique treats and some cultural memorabilia. The box is a good way to try new things and could make an interesting addition to a Russian language/ history homeschooling lesson.